If you're like most homeowners, getting a good look at your roof happens from your vehicle as you move in and out of the driveway shuttling kids or running errands. However, inspecting your roof on a regular basis and mending areas that need repair can prevent unexpected costs later on. Not to mention, keeping your roof in good condition will also benefit you if you decide to put your home on the market. "What should I be looking for, then? ", you ask. Well, the National Roofing Contractors Association (NRCA) recommends inspecting your roof at least twice a year - spring and fall. The best place to start is inside your home, so, grab a flashlight and venture up to the attic. 1) Signs of water damage/leaking. 2) Places where the roof is sagging. 3) Exterior light shining through the roof. 5) Scan the roof for loose material/wear around the chimney, vents, pipes and other exposed penetrations. 6) Check all kitchen, bath and dryer vents and ensure they run completely outside of your home - not just into the attic space. 7) Check for signs of moisture, mold, or rot. Water can travel down to its lowest spot before it starts dripping inside the home and mold, fungi and bacteria can grow within 24-48 hours of a water related issue. 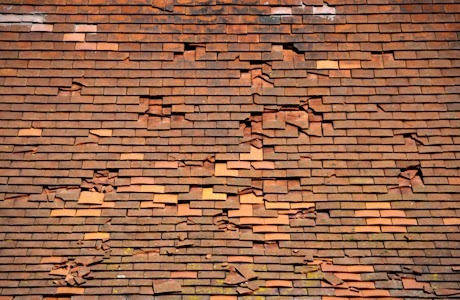 8) Visually inspect your roof for cracked, bald, torn or missing shingles. 9) Be aware of an excessive amount of shingle granules in your gutters - a sign of advanced wear. 10) Examine your drainage and make sure all gutters and downspouts are securely attached. Also ensure drainage is open and allows water to flow out freely.